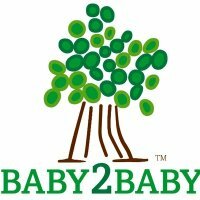 "We are happy to announce Normandy's Bright Ideas has partnered with Baby2Baby. 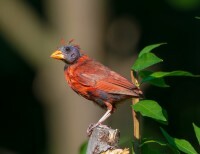 Your Amazon.com purchase helps to support the children Baby2Baby serves living in poverty." "Baby2Baby provides low-income children ages 0-12 years with diapers, clothing and all the basic necessities that every child deserves." Here is how you can help support this wonderful organizaiton with us. Purchase a copy of our book, 'My Little Peanut Does the Nuttiest Things'. The proceeds we receive from your Amazon.com purchase will go to Baby2Baby. If you would like to donate a copy of 'My Little Peanut Does the Nuttiest Things' to Baby2Baby, please make sure the Shipping Address is for Baby2Baby. The address for Baby2Baby is listed above. If you would like to donate items to Baby2Baby, please visit their Baby Registry for additional information. Normandy's Bright Ideas will be collecting items once a month to mail to Baby2Baby. Bibs, Socks, Baby Clothes, Baby Bottles, Pacifiers, Baby Toys, Baby Books and Pampering Items for Mom (socks, books, cosmetics, lotions). The 34-page book is packed with verses which capture the familiar issues parents often face when dealing with a toddler – asking a repeated question, angel at home/devil in public, tantrums (yours and theirs) – the list goes on. 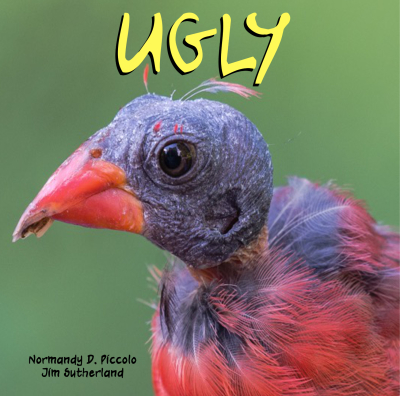 The frustrations quickly become relatable chuckles as parents reflect on their own toddler’s nutty behavior with each turn of the page. 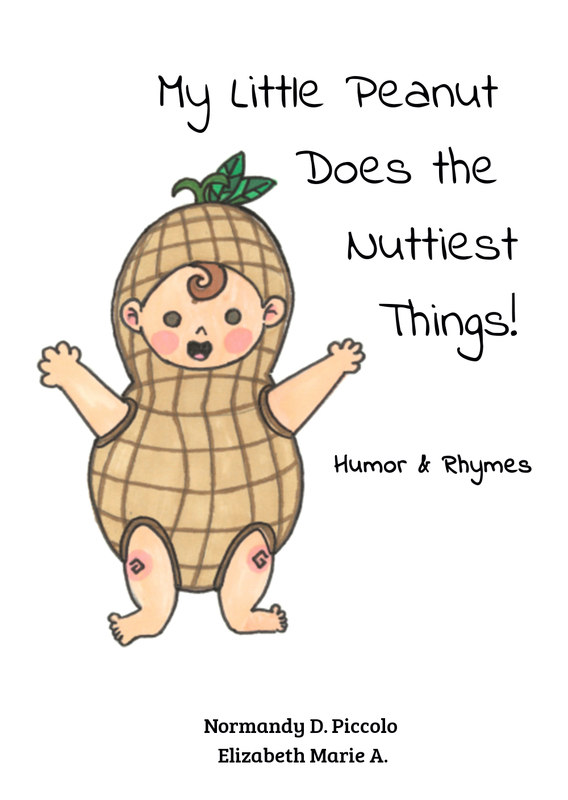 With illustrations by Elizabeth Marie A., My Little Peanut Does the Nuttiest Things is both adorable and pants-weeing funny. According to the latest statistics by the U.S. Department of Housing and Urban Development (HUD), America’s homeless problem is not improving, but getting worse. There are approximately 554,000 homeless people living in the United States. Many of them have no means of shelter. They are living on the streets without any housing. Many Americans are living paycheck-to-paycheck. It is not a far stretch to imagine that one could find themselves in this very boat. So, what can we as individuals do to help stop this growing problem? Read on and discover a Project that has been implemented in other cities with success. "Change Brings Hope - Helping the Homeless" Project. The purpose of 'Change Brings Hope - Helping the Homeless' Project and other projects like it, is to offer employment, low-cost housing, medical treatment, mental health treatment, housing, substance abuse treatment and other necessary homeless services that are currently available – but perhaps not utilized enough. The program will not only provide help, but it will also give people pride in work, confidence, hope, faith and a future. The program will also help the community understand that ‘Change’ does indeed bring ‘Hope’. We strongly encourage you to download a copy of the 'Change Brings Hope - Helping the Homeless' Project and accompanying letter, and send it to your City Mayor's Office and State Governor. Also, get in touch with local Homeless Shelters and see about working together to help bring the 'Change Brings Hope - Helping the Homeless' Project into existence in your area. Thank you to Mayor Bob Buckhorn for forwarding the Change Brings Hope Helping the Homeless Project to the Tampa Hillsborough Homeless Initiative (THHI). Please let us know if you use the Change Brings Hope Helping the Homeless Project in your area. 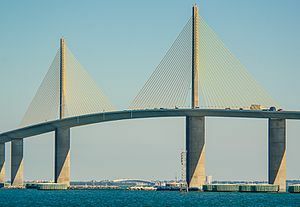 The Bob Graham Sunshine Skyway Bridge, better known to the Tampa Bay Area as the ‘Sunshine Skyway Bridge’ was built September 6, 1954 and then rebuilt in 1982, after the tragic collision of 1980. From the moment it was built, the Sunshine Skyway Bridge has been steeped in tragedy. On May 9, 1980, the bridge was partially destroyed when the freighter MV Summit Venture collided with a pier during a storm, causing 1,200 feet of the bridge to collapse into Tampa Bay, resulting in 35 deaths. But, prior to the collision, the bridge was already claiming lives. And not due to traffic accidents. By suicide. Since 1954, people have been going to the Sunshine Skyway Bridge to jump to their death. Thus, giving the Sunshine Skyway Bridge the nickname ‘The Suicide Bridge’. The Crisis Center of Tampa Bay has taken measures to try and prevent desperate people from jumping by installing call boxes which connect directly to someone in the Crisis Center. 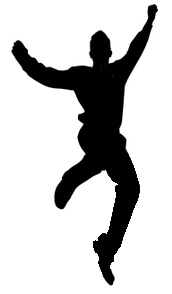 But that is clearly not enough, because as of 2017, it was reported by www.skywaybridge.com , that not one ‘jumper’ picked up the phone and asked for help. And the number of people jumping off the Sunshine Skyway Bridge continues to increase. The Crisis Center and the media rarely cover this issue out of fear that “it might give someone who is feeling suicidal the idea to jump to their death”. Well, it is a fact that issues cannot be dealt with, let alone resolved unless you put a light on it and talk about it. The fact that the Sunshine Skyway Bridge has earned the nickname ‘The Suicide Bridge’ makes it no mystery to folks in the Tampa Bay Area. So, why not bring this issue to the forefront and help reach those who are in the throes of a crisis and need that last reason to stay and not end their life? And so, the ‘Save A Life’ Project was born. The purpose: To offer a person in a life crisis encouragement, get them to pause and think and perhaps reach out for help or remain on the bridge long enough for help to arrive. This may be achievable by placing signs where they are clearly visible that reach out to those who are crying out for help. If you have a bridge in your area that is being used by ‘jumpers’, we strongly encourage you to download a copy of the 'Save A Life' Project and accompanying letter, and send it to your local Crisis Center, City Mayor's Office, State Governor, Department of Transportation, Local Media (TV/Newspaper), State Highway Patrol and the Attorney General of Your State. Please note: This letter/project are for bridges constructed with jersey barriers, but regardless, can still be tailored to fit the type of bridge in your area. If there are not Call Boxes available on the bridge, talk to you local Crisis Center about getting them installed. I say in my book, Bullied Dying to Fit In, “Words can lift you up.” It is amazing how much power words have. It is amazing the difference a kind or supportive word can make to someone in a crisis. Download a copy of ‘Save A Life’ Project & Letter. Please visit www.skywaybridge.com , who we recently joined with to help spread awareness about the Save A Life Bridge Suicide Prevention Project. Skywaybridge.com offers a lot of information about the bridge, including current statistics, jumper prevention and links to get help should you or someone you know feel suicidal. Please let us know if you use the Save A Life Bridge Suicide Prevention Project in your area. My name is “El Feo” which in Spanish means, “The Ugly One”. But I am beautiful, inside and out. 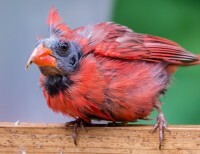 I am a Northern Cardinal and despite being bald with a few sporadic feathers sticking up in different places on my head and a malocclusion beak, I am irresistible to almost everyone I meet. 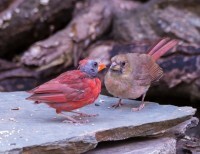 When I was a baby, I flew into Mr. Jim’s backyard and eventually his heart, too. Over the years Mr. Jim has documented my life in pictures and kept a close eye on me. 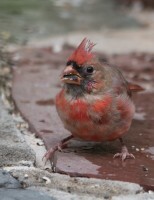 He spoils me rotten with my favorite food, Safflower seeds. This is my story. It is one of a special friendship, the overcoming of incredible odds for survival and a lesson in self-acceptance. 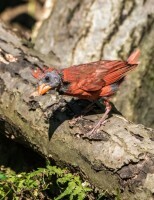 Interesting facts and knowledge about Northern Cardinals are sprinkled throughout the book Educational questions, topics of discussion and activities are available in the back of the book for classroom teaching. never met me! Tink! Tink! Tink! 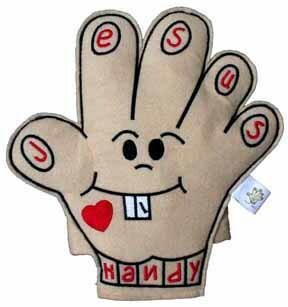 Healin' Handy was a puppet we used to send to several cancer charities to distribute to ill children. Healin’ Handy is part puppet on the palm side and part cuddly companion on the backhand side for you to snuggle up with when you need a spiritual hug or don’t feel good.